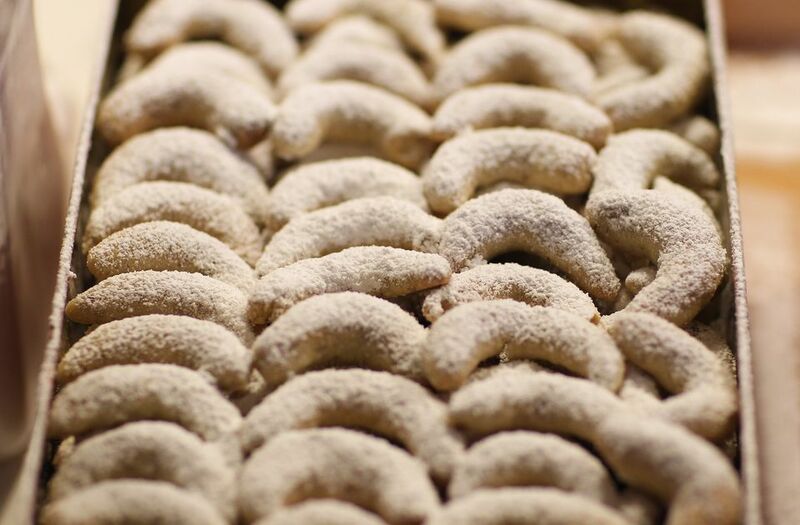 Pecan crescents are butter cookies with chopped pecans and a confectioners powdered sugar coating. This simple pecan crescent cookie recipe makes a delicious and versatile cookie. They are perfect for a sweet treat, an afterschool snack, or even for a holiday party or cookie exchange party. The recipe is very easy for beginning bakers to make. All the ingredients are easily obtained from a grocery store (or even your own pantry) and the preparation time is short. If you don't like (or don't have) pecans, you can use other nuts. Try walnuts, almonds, or even peanuts. If you want to totally omit the nuts, that's fine too. You'll be making shortbread crescent cookies which will be plainer, but delicious. Cream butter and then gradually beat in 1/2 cup confectioners sugar. Add 1 teaspoon vanilla, the flour, pecans, and salt. Blend well. Chill the mixture for 1 to 2 hours in the refrigerator. Shape dough into crescents, using about 2 teaspoons for each cookie. Don't worry if your shapes aren't perfect. As you move through the dough, you'll likely find that you get better with practice and your crescent shapes will become more uniform. Place cookies on parchment-lined baking sheets and bake at 300 F for 18 to 20 minutes. They should be just golden brown. You may need to rotate the cookie sheets halfway through the baking to get a more even bake. Cool the cookies on the rack until just slightly warm. Combine 1 cup confectioners' sugar and 1 teaspoon vanilla. Roll warm cookies in confectioners sugar and vanilla mixture until they are coated. Let them fully cool on a baking rack. Store them on a plate for a day or two and then a sealed container for any longer. If you like making cookies, there are so many cookie recipes to try. For a non-traditional twist on shortbread cookies, try these brown sugar shortbread cookies, which swap white sugar for brown. Another shortbread-style cookie is the irresistible meltaway butter cookie. Both use common pantry ingredients and are perfect for anyone from a beginner baker to a more experienced dessert aficionado. Homemade cookies make a perfect gift for so many social situations. Packed in a nice tin or even wrapped in a box, they are appropriate as hostess gifts, thank you gifts, or "just because" gifts. Be sure to label the cookies and list ingredients, especially if the cookies contain nuts or other allergy-sensitive ingredients. If you plan on giving cookies as gifts often, it's wise to invest in cookie tins with tight-fitting lids (especially if you will be mailing the cookies or they will be traveling long distances) or cardboard cookie boxes. Store them with your wrapping paper and you'll always be ready for the giving season.